If you have followed MoscatoMom long, you know that every year I set a ridiculous, huge BOLD Goal. One year it was to do twelve 5ks in twelve months, one year it was to double my income, one year it was to lose thirty pounds. I achieved two of the three – and it was not the one that required a scale. Back in January I set a BOLD personal goal to do a triathlon this year – which I completed back in July. In training for my triathlon though, I discovered a love for running – one that funny enough I had not found during my year of 5ks. In striving for my BOLD Goal of the triathlon, I ended up setting other goals – one to run a 10k (which I did – not once, but twice) and then I signed up to run the Battleship 12k. However in August I injured myself on a run, which “grounded” me for quite some time. Lots of pain, lots of doctors appointments, and lots of tears later, my doctor said there was “no way” I would run that 12k. I was crushed. I resolved to not run – said I would take the Fall off and begin training in the Spring. I told my friends that I registered with that I would not be joining them at the Battleship, and I put the whole idea out of my mind. 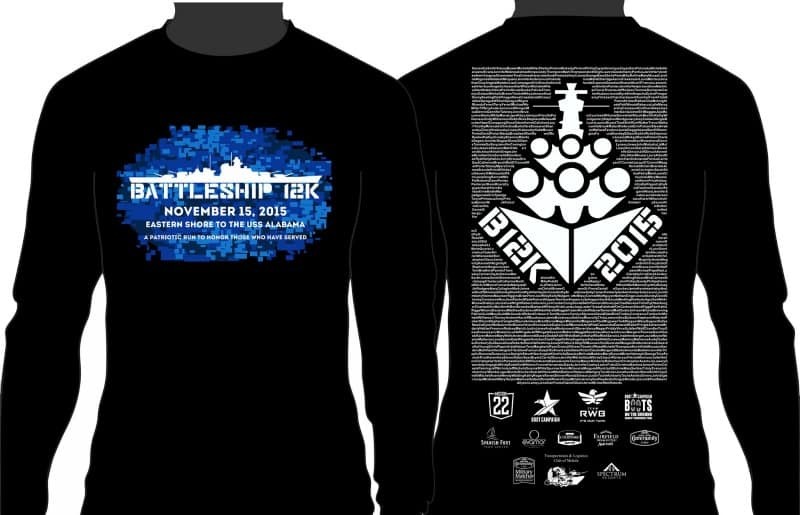 But then the week of the Battleship 12k arrived. And I saw a picture of the race shirt… and they had put all of our names on it. There was my name – in print – on hundreds of race shirts. I had to do this run. It was 48* when my alarm went off at 4:30 Saturday morning – “freezing” for this Florida girl. I layered up and headed to Spanish Fort – nearly an hour away. Picked up my packet, met up with my friends, and began to stretch – paying special attention to my injury, praying as I warmed up. We huddled behind bushes to break the wind until it was time to begin. We sang the National Anthem, had a moment of silence for Paris, and then we were off. The first three miles were fantastic. I started the first half mile walking a quick pace to let my shins warm up – and then began running with no pain. I caught up to friends who had begun running, and we began intervals together – laughing and joking at how far apart the poles were. (we did distance instead of timed intervals) Although we certainly were not “warm” – at least the chattering had stopped, and before I knew it, we were posing in front of the “Mile 3” sign. Had this been a 5k I would have been just perfect… but it wasn’t. We still had 4 1/2 miles to go. Mile 4 I began feeling my injury… slowly, but it was certainly there. Angie began feeling hers as well and Meagan was feeling the beginnings of blisters – but the three of us made a pact that we would finish together no matter what. We kept up with intervals, though they got fewer and further between. We told a few of our friends to go on up ahead – that we would see them at the finish line. The fifth mile was absolutely excruciating – I wanted to quit with every painful step. We slowed to a fast walk – and just kept going. Before long it was a slow walk, as people passed me and asked if I was ok – seeing my obvious limp. 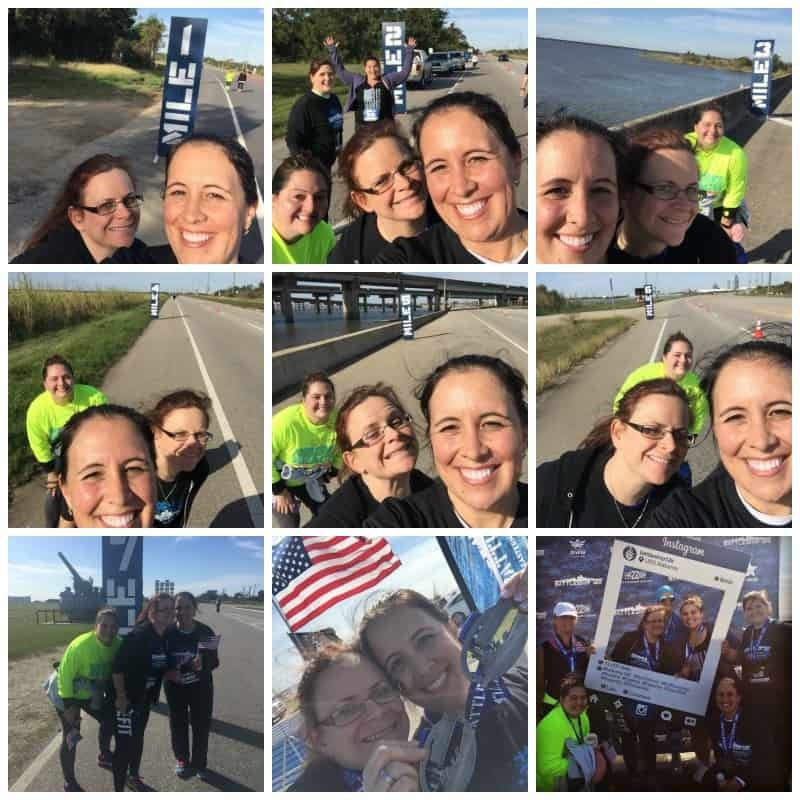 I thought we were never going to see that Mile 6 sign, and when we did I really wanted to kick it – knowing that had this been a 10k we would be done… but we weren’t… we still had a mile and a half to go. That last mile and a half I think delirium kicked in. It was a mixture of laughing and cursing – the three of us absolutely over this race. 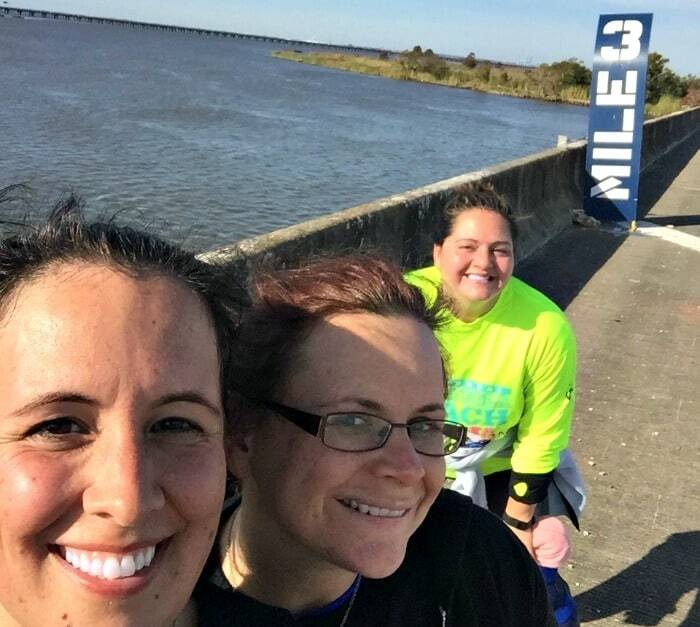 We laughed at the cars driving by seeing this trio of limping ladies with run bibs walking down the bridge. We could see the finish line over the water – and spent a few minutes contemplating how much easier it would be to just swim the remainder of the way there. We finished that 12k with our slowest time ever, but we finished. A young soldier was standing at the finish line and placed a medal around my neck as I crossed – “great job ma’am – you stayed with it” he said with a smile. I could only laugh. I spent the rest of the day in my boot – with ibuprofen and a couple hot baths. I went to bed early – certain that I was going to be unable to put pressure on my foot the next morning…. While I WAS sore, the pain that I had felt from my run back in August was not there. I stayed in my boot all day, and by that afternoon when it was time to teach my POUNDFit class I was good to go!